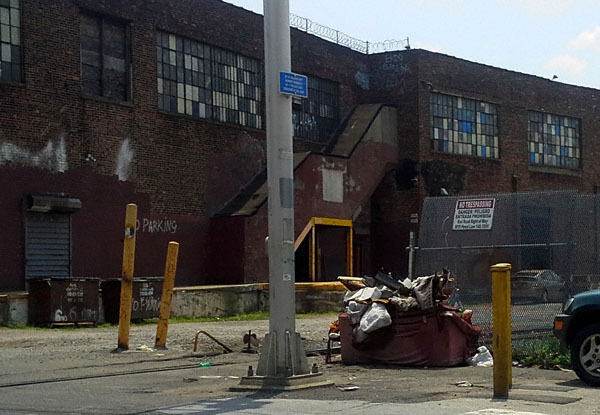 It has been brought to my attention that Mr. John Ciafone, in fact, owns a great deal of property in north Brooklyn. I learned this from two people who have had the misfortune of being his tenants. If anyone wishes to share their experience of having this fellow as a landlord please shoot me an email at missheather (at) thatgreenpointblog (dot) com. Your identity will remain anonymous if you so desire. 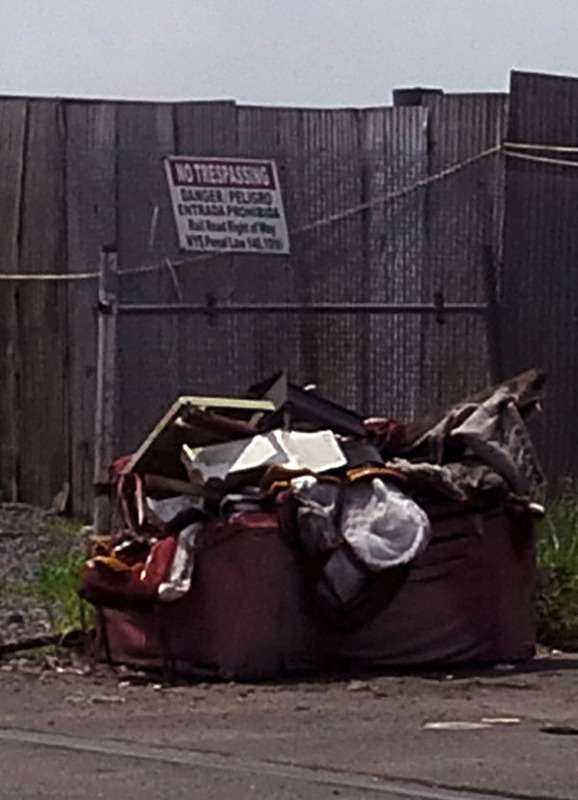 This magnificent example of value-added feral furniture hails from Metropolitan Avenue and Flushing Avenue and comes courtesy of Queens Crap. Any takers? Taken New Year’s Day by Charles Le Brigand. Taken by Charles Le Brigand. This item comes courtesy of the folks at Ghostbikes.org. On Sunday, March 18th, they will be conducting their 7th Annual Memorial Ride & Walk. Follows is a general outline per their press release. The Annual Memorial Ride and Walk brings New Yorkers together to remember pedestrians and cyclists killed in our city over the past year. This will mark the seventh year that this event has occurred. Riders will visit the site of each ghost bike, a white-painted memorial for cyclists, installed in the past year. Please help us show solidarity with the family and friends of those lost by joining us for this important event. Bring flowers and other items to honor those lost. Those of you who are interested in attending any of the above-listed events can RSVP via Facebook by clicking here. Otherwise you can get more information and updates at Ghostbikes’s web site. Given our very own 94th Precinct reported 77 pedestrian/motorist accidents in 2011 (two of which were fatalities) versus 47 in 2010 (still not a stellar figure), I strongly encourage any and all north Brooklynites to participate in this event. 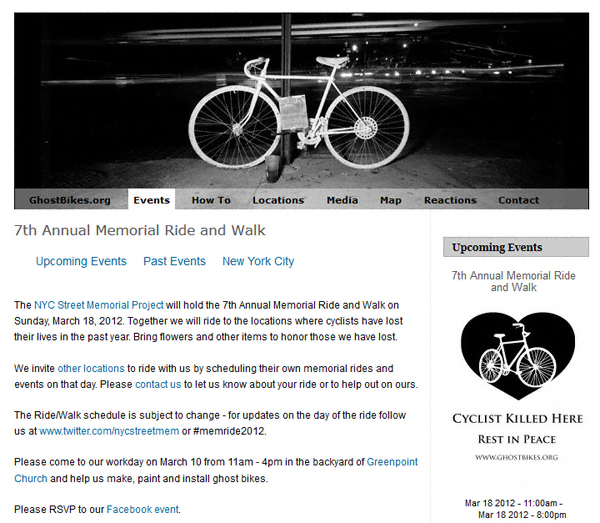 Be it by attending the Memorial Walk/Ride proper or helping with the creation and installation of ghost bikes at the Greenpoint Reformed Church thsi upcoming weekend (March 10th from 11:00 a.m. to 4:00 p.m.) we can make our voices heard!